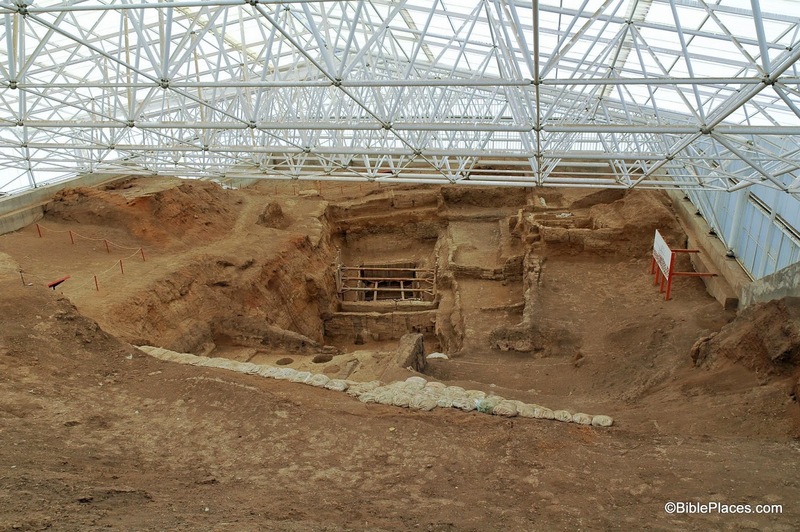 Çatalhöyük (Catal Hoyuk, Catal Huyuk) is located in the Konya Plain, about 21 miles (37 km) southeast of Konya (ancient Iconium). It is the largest Neolithic site that has been discovered and is very well-preserved. The site consists of two flat mounds, a large mound to the east and a smaller mound to the west. 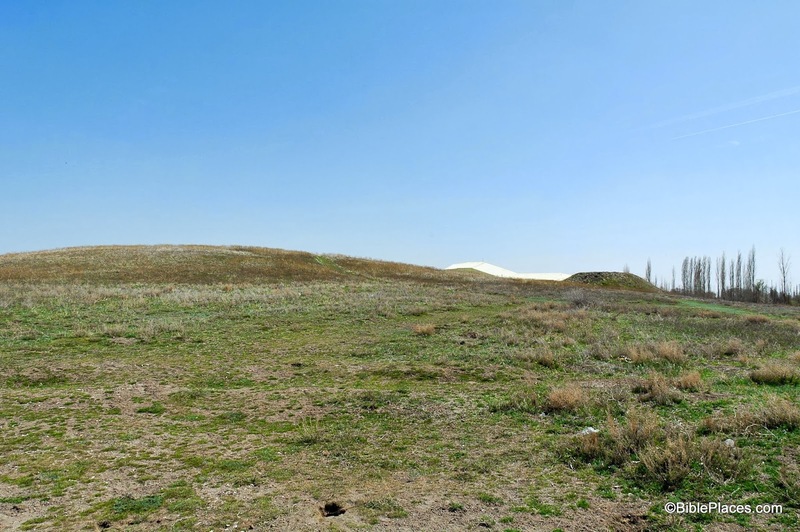 The mounds are said to resemble the shape of a fork, hence the name of the site (çatal is Turkish for fork). The eastern mound of Catalhoyuk rises 65 feet (21 m) above the surrounding plain and covers an area of 32 acres (13 ha). Thirteen occupational strata have been excavated dating to the Neolithic period, the earliest of which dated to ca. 7200 BC and the latest to ca. 5500 BC. The town had a population of up to 8,000 people. And the surface of the tell is nothing to write home about, as you can see in the photograph below. Catalhoyuk is made up of domestic dwellings packed together without any streets. The people moved about on the roofs of the houses and entered the houses through holes using ladders. The houses were made of mudbrick and the interiors were plastered and decorated with murals. Houses typically consisted of two rooms with raised platforms along the walls.... An oven was often located near the ladder, beneath the hole in the roof. Throughout the town, there are a number of large courts. 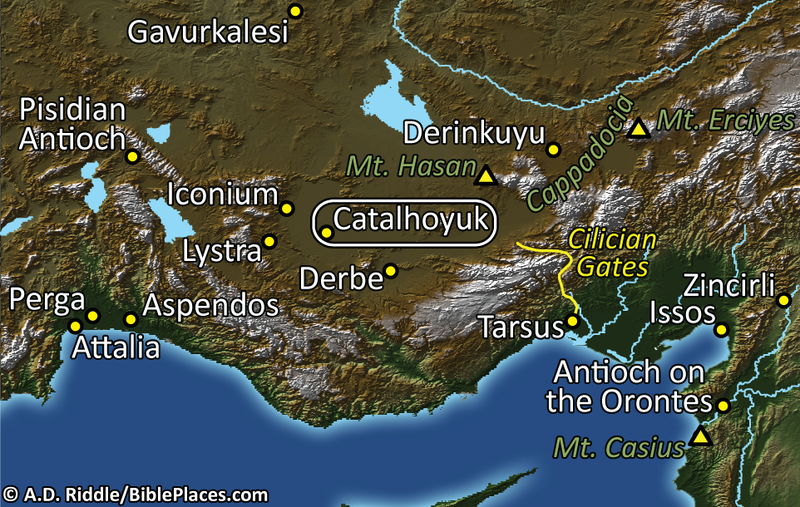 So the next time you are tempted to complain about your neighbor's kids playing too loud in the backyard or the high volume of traffic that passes in front of your house, just be grateful that you don't live in the ancient city of Catalhoyuk where your neighbors would have walked on your roof on their way to work. These photographs and annotations are available in Volume 9 of the Pictorial Library of Bible Lands and is available here for $34 (with free shipping). Other photographs from this volume can be seen here, here, and here. A helpful video that shows a reconstructed time lapse of how the city was built and the ruins were formed can be found here. Seth, how does Catalhoyuk relate to biblical history? I'm not sure, Wayne. I'm pretty new to archaeology in Turkey. Do you have any insights you would like to share?